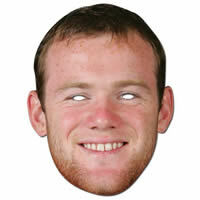 A Wayne Rooney mask - perfect for football fans! this wayne rooney mask is a great bargain and great quality and best of all so funny! love it, will def be buying more celeb masks! great service ordered on friday,late afternoon delivered sat by royal mail.mask just what i wanted,would and recommened this product.